Email startups individually - you can visit the websites on this list, and use the "contact" forms on each. 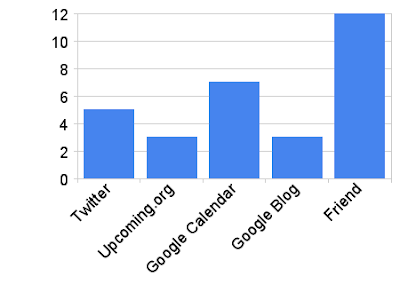 To give you an idea of the effect of various types of advertising, here's a graph from the AppEngine talk registration that shows how people found out about the event. Most reported that a friend told them about the event, and presumably their friends were one of the people that found out from one of the original sources. Of the original sources, the biggest referrer was "Google Calendar" - the calendar embedded on the Startup Australia website mentioned above. But basically, as you can see from the chart, every little advertising source counts - so be thorough. (Note: I didn't email any startups or user groups for this talk, but when I have, they've also contributed to the turnout). Totally agree with you Pamela on this. Interested by your "friend" result. You know what I think happens. People need to see you in a number of different places, and then they will act. So they might see you on Upcoming, then on the PHP forum, and then they get an email sent around the office, and suddenly your event looks like a really good idea. So, yeah, my advice would be the same as yours - it is really worth your while to sit down and plug away at getting in as many places as possible. At Web Directions, we spend close enough to nothing on paid advertising.